Developer BRE's contentious Wilshire La Brea project, that Thomas P. Cox Architects-designed development, was unanimously approved by the Planning Commission today. 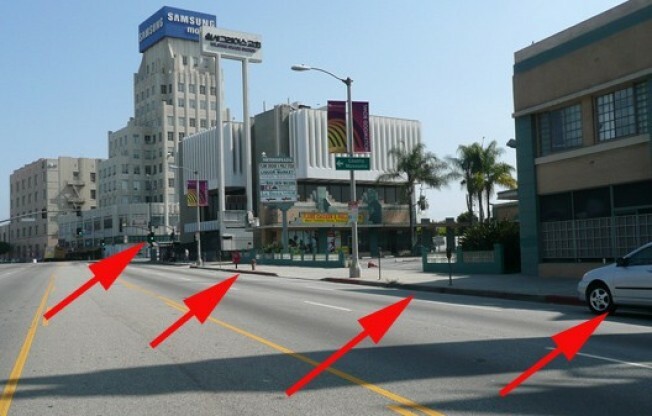 As seen above, development would basically take out a whole city block: It would rise on the site of old Columbia Savings bank, a building that LA Conservancy is fighting to protect, as well as the now-vacant Metro Plaza shopping center. The six-story, 482-unit apartment development, proposed to have 40,000 square feet of retail, would join other new or proposed developments in this section of mid-Wilshire, including BRE's 5600 Wilshire project down the street. One concession seen today: Some of the penthouses will be eliminated--about nine or ten units--so the project won't be seen from houses on Sycamore. Next, the development will be heard before the Planning and Land Use Management Committee and then City Council.